Thanks to Laura at Shine the Divine for taking over the hosting of " i heart macro"
That is so very beautiful. It made my heart sing - thank you. So beautiful ... love this capture! Beautiful shot with one fantastic water drop! pure magic Karen! Thank you for sharing the love up-close at I Heart Macro! That is ab absolutely marvelous photo- WOW!! I enjoy the suspense of waiting for that drop of water to fall! Not only did you share an awesome macro flower, but a water drop that made me smile. One superb macro, the droplet perfect. Greetings from Jean. 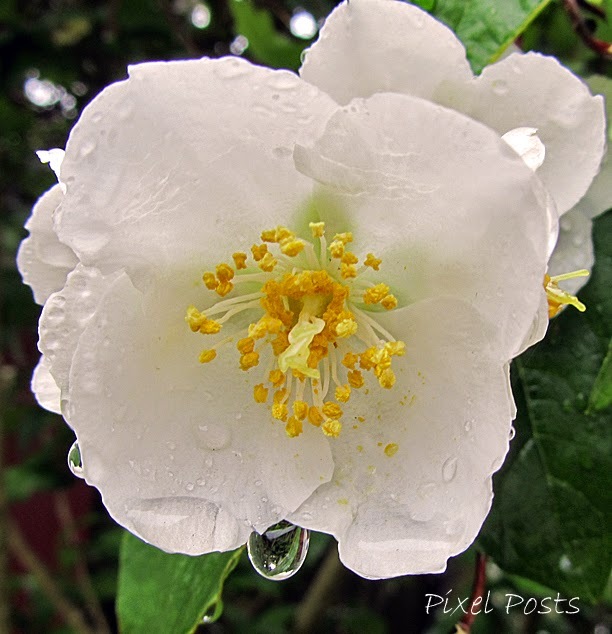 Such a beautiful white flower with raindrops! there is just something about white and a droplet....this is just gorgeous karen!! This is such a lovely pictures. That flower is gorgeous and water drop is just the icing on the cake. A beautiful macro! Thanks for the updates on the memes. I hate it that Macro Monday is homeless. Will you take it in? Great capture of that water drop waiting to fall! The water drop really adds a nice pop to the flower. Excellent shot. The water drop is beautifully captured. There's not much fresher than a spring blossom. Especially after a rainfall. Lovely shot. Nice picture - thanks for the tip about MM. beautiful. love the droplets of rain. I love the raindrops of this beautiful flower! That huge raindrop is gorgeous! Beautiful Karen. Boom & Gary of the Vermilon River, Canada. Beautiful capture of the droplet and flower! Oh my, that is such a gorgeous pic! Beautiful shot, I love that raindrop. It is a beauty with those water droplets. Is that a macro of philadelphus? It looks lovely. Wonderful...I was kind of just staring at the beautiful blossom waiting for that drop of water to fall! That is a lovely flower. Love how you captured so much detail inside the flower. very beautiful picture! love the waterdrop! From my favourite bush. Love the raindrops, nice macro.